From left: Mr Duncan Hay, Professor Albert Modi, Dr Shamim Bodhanya, and Mr Bongani Khumalo. 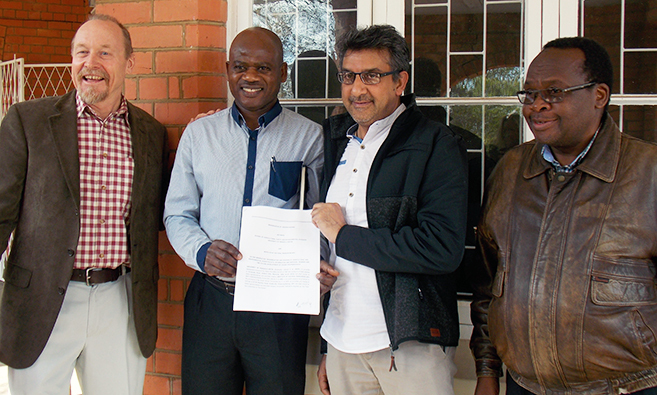 The Institute of Natural Resources (INR) and the University of KwaZulu-Natal (UKZN) recently celebrated the signing of a Memorandum of Understanding (MOU) between the two institutions, formalising a relationship that has stretched back almost thirty years. The INR began as an institute of the then-University of Natal until it became an independent entity in the mid 1990’s. It is an applied research organisation which advocates for the natural resource and environmental management sectors in southern Africa. Despite UKZN and INR’s work and relationship diverging somewhat over the years, Executive Director of INR Mr Duncan Hay emphasised the importance of recognising the University as the “parent” and originator of the organization. Operational relationships between UKZN and the INR have remained strong over the years, particularly in Disciplines such as Hydrology, Geography and Environmental Sciences and Crop Sciences. ‘In re-establishing an MOU with the Institute, we already have a relationship that has a life and has direction, and has great opportunities ahead of it,’ said Hay. Acting Deputy Vice-Chancellor (DVC) of UKZN’s College of Agriculture, Engineering and Science (CAES) Professor Albert Modi gave insight into the structuring of UKZN’s Colleges to facilitate multi-disciplinary and far-reaching research. ‘It is clear that we have to reinvigorate the relationship and have clear definitions of our collective mission,’ said Modi. He went on to note the importance of science produced in South Africa being applied to be of benefit to the country that produced it. This, according to Modi, formed the background for what the University and the INR can do together. Modi encouraged the INR to draw on University research through collaborative work. Dr Shamim Bodhanya, the Chairman of the INR, said the MOU demonstrates that the University recognises value in the work of the INR. This MOU also opens up linkages to universities in the United Kingdom with whom the INR is working on projects that include the resilience of fresh fruit and the management of water resources.